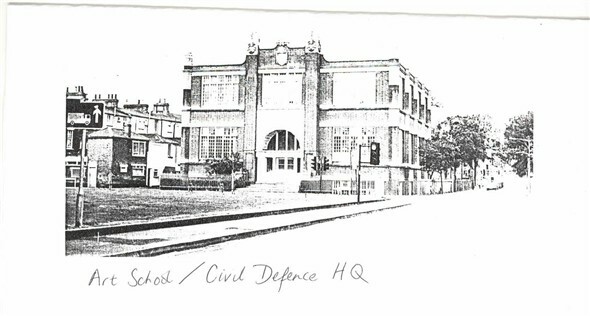 Art School as Civil Defence Headquarters - does anyone have information on the history of the building? The old art college in Trafalgar Road holds happy memories for many former students. But did you know that as the civil defence headquarters it was the building where emergency services were coordinated during the war years? We'd like to hear from you if you have memories of working or studying in this landmark building. This page was added by Paul Douch on 01/07/2007. I remember the Art School - it was where I studied the finer arts of decorating under Mr. Buck, but I believe there was another teacher before him who also taught us but sorry can't remember his name. Maybe some of the other lads who were there at that time can remember, who the other teacher was before Mr.Buck. We used to do brush graining and sign writing, marble coating and so forth. I was apprentice at Lacons Brewery Building Department which had its offices between the Hospital School and Jack Mays butchers shop and the workshops down St Nicholas Road. I attended styles school just down the road from 66 till 70. We used to go to the art school once a week for metal work. I loved it.